Evening all! It's quite a London landmark - but, even though it is probably the most iconic piece of London 'street sculpture', I can't find out who designed it. Somebody must have designed it mustn't they. But who? Does anybody know? Or can anybody find out where I have only drawn a blank? Re: Who designed this London landmark? The internet is somewhat obscure on this point, but my searches did come up with this gem where someone went to the trouble of requesting, under FOI laws, the annual cost of keeping it rotating (~£200, if you don't want to read the full response). Furthermore, the new HQ was designed by a team at AHMM - but they're understandably preserving the iconic sign. Short answer: "no idea, mate"
Thanks for the sleuthing Siasl! Looks like we need a few CID detectives on this to crack the mystery of whodesignedit when it comes to Scotland Yard's lovely revolving sign. The AHMM you mentioned Siasl are the architects ALLFORD HALL MONAGHAN MORRIS (about the 3rd biggest architects firm in Britain but not as famous as Norman Foster & his mates etc) who were responsible for the new New Scotland Yard building that the Met moved in to just a couple of years ago. But I can't find out who designed the original old New Scotland Yard at Broadway, Victoria, London. 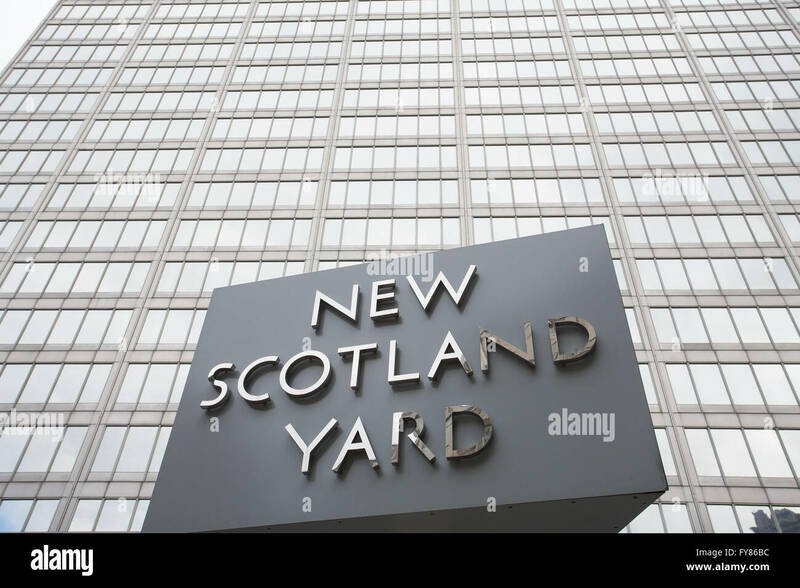 I'd presume the architects who designed the old New Scotland Yard slab on Broadway in the late 60s also designed the revolving sign - and it does (to me at least) look like a typical architect's set-square-and-rulers kind of design job. Of course, rather than design it themselves, the original architects might have called in a freelance artist to do the sign - but then I'd have expected it to be more free-form and arty and less sharply triangular than the revolving sign. So maybe it was designed in-house by some un-sung and forever anonymous lowly office junior - or maybe the original big bosses of the original architects were pretty dab hands with a pencil and sketched it out themselves? Who knows? That's my theory anyway. So far. Of course, if any IA-ers have a Sherlock Homes moment and can come up with a better theory, I'd be very chuffed to hear it. Could be, Siasl. But not sure. I remember the New Scotland Yard Building as being a glass slab - at least it was when I used to work in Victoria. As you can see from the two pics below, the first pic is a more traditional stone job. Maybe though Curtis Green did do it. Because your Wiki link does say (under the heading 'Architectural Works) that Curtis Green designed the "◾Extension, Scotland Yard, Victoria Embankment (The Curtis Green Building) (1937–40)". The 'extension' doesn't make sense because how can someone 'extend' a building in the 1940s that wasn't even built until the 1960s? Anyway (judging from the stony style of all his other buildings) William Curtis Green did build the New Scotland Yard HQ but some later architect designed the glass slab shown below. And it was more the glass 60s building that was I was thinking od - the one that was always shown on TV News broadcasts. The plot thickens!